The Crux Bridge: An interstellar walk by Winney Zhao is the pinnacle of architectural fashioning, as it demonstrates how physical spatial coordination and the angular definitions that shape the structures, which humans live and work within and around, relate to each other, and also how they offer a resemblance to the refraction of light and motion, which exists, not only to create reality, but also for the depths of the unspoken seas, that engulf land, and the people who are abound. The Maori, as a civilisation, may or may not be in favour of such a space connection, however, when it becomes clear that not only a manifestation of abstraction and the “Pointers” and constellation points, signify much more than what appears, as new movements are made possible, which are respective of singular and plural dots on the linear and the lines that are delineated, to make a whole piece of the puzzle, creating a good force for the progression of developmental education and the lessons to be learned at a later juncture. 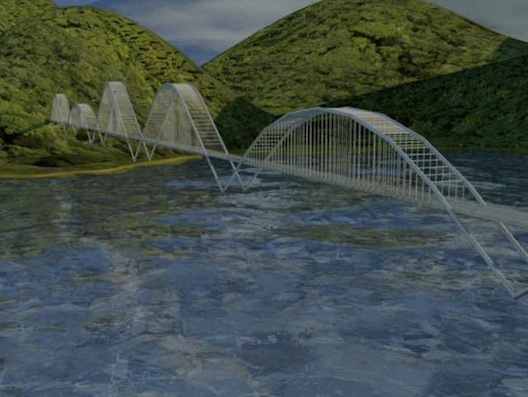 If The Crux Bridge were to be built, there is no doubt that by way of impact with the S-Curve and the infinite byproducts of seamless transportation of vehicles and ideas, New Zealand and the Great Barrier Island would improve, without changing the existence of current waterways. What ology would really make the move through the onramps, straits, and exits and roads? Given what this era of inventors have dreamt and transcribed, there may be room for some creative method to execute journeying and the expedition planning that entails that. By allowing shipping and passenger vessel to pass through The Crux Bridge, only the magical of a quasi-sentient being with nu-silo capabilities, could in fact be the appropriate explorers to revolve with this New Oceanic and Australasian influenced Fibonacci and Maori design functions of both architecture, structural engineering, and the mechanical creations, presented together as what can happen, when there are undiscovered paths to obtaining unparalleled knowledge. A communal bridge that connects Harataonga Bay to Arid Island (Rakitu) using the Southern Cross as a national icon for New Zealand. The Southern Cross was used as a guidance to pointing true south, for the Maori people, it is viewed as a representative for an anchor which was embraced in the design of the truss structure. The design process involves identifying the four major stars of the crux: the Gamma, Beta Crucis, Dekta Cruis and Apha Cruis on Rakitu, as well as the pointers on Whangapoua Beach. The bridge itself points towards the south pole. 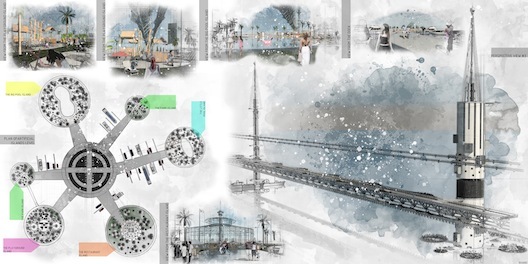 The design of the bridge is to single out and magnify the experience of driving from the roadside to the seaside and above the surface of the sea. A chief concern was to let users experience the clear night sky as a romantic opportunity special to Great Barrier Island. This is also to make the path itself a refocusing experiential mode. Design for the trusses are based on traditional Maori patterns which this relates to waves and Kori. The kori has its roots in the Fibonacci Spiral found across many natural beings. The aim of the design is to create a human and nature experience to immerse to the nature and the vastness of the landscape and seascape. Bring attention to the relationship between the duration of the experience and connection to nature. 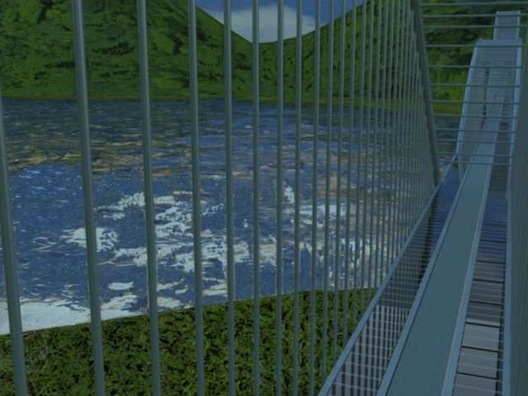 Using a bridge-city and support-skyscraper for the implementation of their thought process, Tetiana and Ihor have created a world of artificial islands. What makes this design interesting is the attention to the varying levels of transport ways (pedestrian, bicycle, car, monorail and helipad). This is a significant improvement upon a use-case for a different scale of bridge, that can create not just physic play, but also economic infusion. Thanks to some brilliant art marks, there is no obstruction in this representation. 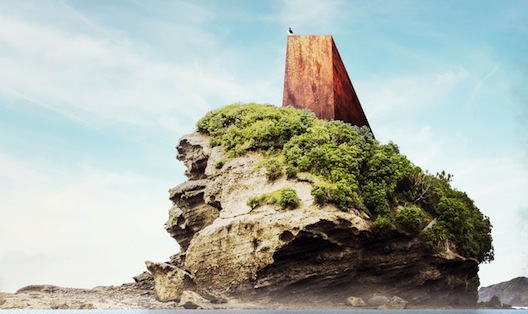 Located above Rarohara Bay, near to the Great Barrier Island Port-Fitzroy, this design by Magdalena is for a proposed construction of an arched bridge. The road of the bridge is composed of three parts: a middle section made of concrete, and a glass composition for the left and right sides of the road. By connecting the multi Rarohara Bay Coasts, and the Port-Glenfern Sanctuary, The Port Fitzroy Bridge unites quadratic and the tertiary, for a very wondrous debacle of modern architecture; in what manner do two parts become a bridge, in the sense of a finished movement? While the brief of this Competition was for the connection of the Great Barrier Island to the Hauraki Gulf, Miguel Angel decided to focus on regeneration of the local marine environment. The harbour growth of the entry was an aspect for consideration, as it is known that the fauna species and flora are aligned with the heart of the landscape that this geography is placed for, and is why the area has a proximal likelihood of a definite survival. When there are no additional ideologies that remain as far as what contributes to measurable work for life on this Earth, architecture could in the future then be in a dilemma, but until then, proclamations like this is why humane functionality is always going to be in order. 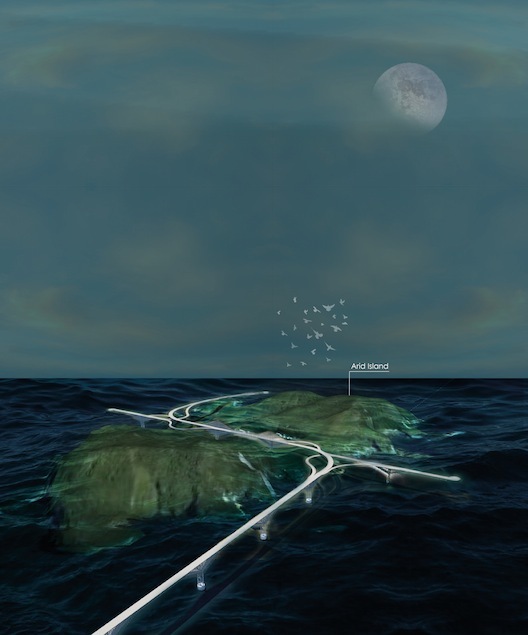 A very unique entry in all capacities, the architect group from India of Amaldev, Arjun, Garima, Gokul and Karthik, has written and designed The Bridge of stories after a sunken ship made way for the introduction of a carrier pigeon service between Auckland and the Great Barrier Island. What what history remained, may have been resolved with their Miners head dock and main land absorption, to a next era pigeon story and bridge experience, which serves a serious lesson as far as how we as a relatively young being to exist, can learn what happened, how it happened, and why the untold and told grams of information, are never to be a distraction in the histories that eventually become truth. Thanks to this year’s participants, best of luck to the entrants. The winner and honorable mentions are to be announced October 1, 2018. 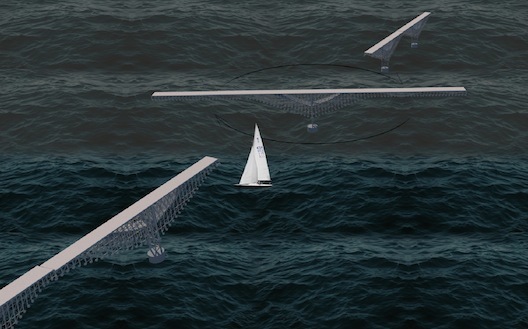 The 2016 MNPG Arch Competition was for the design of a tech port beacon. For the 2018, the space has evolved towards a wider approach to competitive thinking. 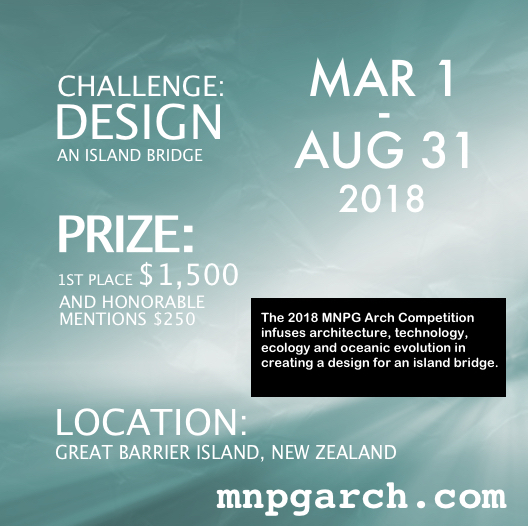 MNPG Arch is asking architects in the international community to propose a solution for an island bridge starting at the Great Barrier Island. To learn about this year’s competition, please refer to the navigation in the sidebar or here: Context, Entry Requirements, FAQ, Images, Other Info and Legal and Submission Guidelines. The prize is $1500 for the winning entry and $250 for each honorable mention. Please stay up to date with the competition’s progression here on the MNPG Arch blog- wishing the competing teams and individuals the best, onwards and upwards.